I hate to say it, but gratitude has become a trend. It’s hip and cool and on pointe (or whatever the kids are saying these days). You can’t open a magazine, pull up your favourite wellness blog or listen to a podcast without hearing about the benefits of gratitude — the potential to uplift humankind, to evolve us as individuals and to bring us together around a common good. It sounds slightly too good to be true but gratitude has a proven record of effectively and efficiently making us better, happier, stronger people. When you become a more grateful person, your confidence grows, your creativity blossoms, your energy unfolds. Gratitude helps you become healthier, more motivated, more resilient. It can even fuel well being, communication, mindfulness and courage. I’ve been focused on gratitude for a decade now — both experiencing it for myself and sharing with others the brilliance that is positive thinking. Yes, I’ve been into gratitude before it was cool, and I’ve been there as gratitude has become a movement — a siren song for those who want to live a more confident, compassionate, sitting-on-cloud-nine life. It’s so massive now that the UN even signifies today (September 21) as World Gratitude Day: a day for every single person across the globe to celebrate the treasures in their lives. Because it is World Gratitude Day and because gratitude is the trendiest non-trend out there, here are eight life-changing habits of grateful, positive, happy people. I call them the grateful eight. Gratitude can shake, rattle and roll your world…but not instantly. Sorry, my friend, it’s not something that just happens. You have to put in effort, but trust me, that effort will pay off (see list above of all the cool stuff that gratitude can do). What does that effort look like? It starts with making gratitude a habit. For me, a gratitude habit comes in the form of writing down my top five positive things each day. When you set a goal of highlighting each day’s positives, you begin to look for positives around every corner, in every nook and cranny of your daily experience: the compliments, the smiles, the surprises, the connections, the little moments of romance or joy or carefreeness or beauty. Good things are all around you… you just need to prime yourself to notice them. You need to take those positive thoughts and put them down on paper. I’ve done this for 10 years, and I’ve collected over 10,000 positive thoughts. It’s like having a library of my favourite things, people, happenings and moments, and this collection serves as a constant reminder of everything that makes me grateful. Volunteering is like a hug for the soul. It’s eye-opening, muscle-building, heart-expanding, toe-tingling selflessness — which actually makes you feel better than if you had done something for yourself. They call it a ‘helper’s high.’ Again, science says so. When you take time out of your day to support others, it can help you gain perspective on your own challenges and help you see the positive outlooks of those living in much tougher situations than yourself. Plus, you get to see the impact of your efforts in real time. 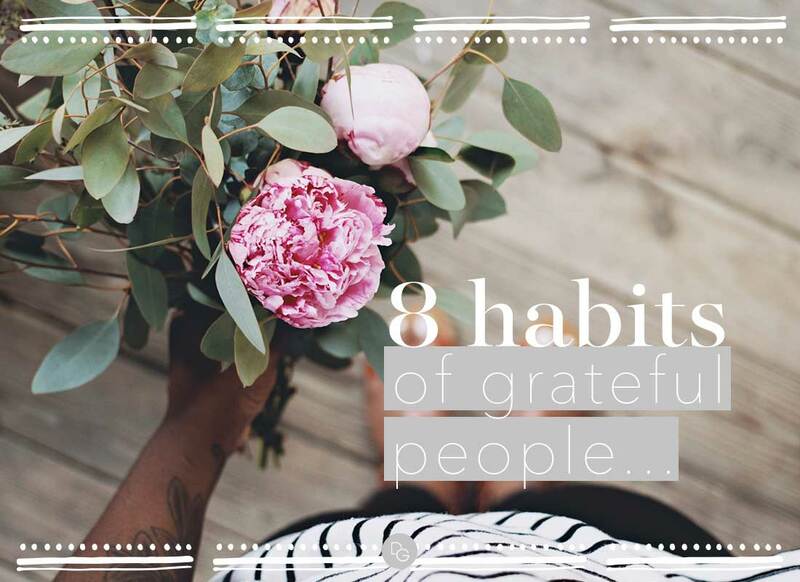 Being grateful doesn’t mean enjoying the big stuff: the jaw-dropping, speech-worthy, champagne bottle-popping accomplishments that come every so often. Being grateful is about the little stuff (the things you probably would ignore if you were not such a positivity pro). When you enjoy the small steps, you are more likely to build momentum and make giant leaps. Run a kilometre today? Smile, savour, feel good about your effort. Remember, today’s kilometre can turn into tomorrow’s marathon. What you say matters. The words that come out of your mouth have influence over your mindset (and visa versa). You don’t have to write an analysis of your most recent work project, you get to. You are not busy, you are being productive. Instead of saying, I really sounded stupid when I started my presentation today, say, I finished really strong! Focus on language of empowerment, inspiration and positivity. As a grateful person, it doesn’t mean you ignore adversity or can’t turn a critical eye to something that needs improving. It means we learn from life’s hardships. Think of a challenging time in your life. Looking back, you can focus on all the lessons you learnt and obstacles you overcame to get to where you are today. You can draw strength from your past challenges to help overcome future ones. Remember when I described my vision of a grateful, positive thinking world? That vision cannot be realised without ‘positive, gracious action.’ Real progress happens when we turn thinking into action. That means action toward your goals, toward overcoming challenges, toward becoming the person you want to be, toward supporting those around you and toward building a world of people empowered by gratitude-fuelled thinking. Do you practice gratitude? How do you do it? How has it changed your perspective? Share with us in the comments below! A coach, speaker, product developer and founder of the Top Five Movement.